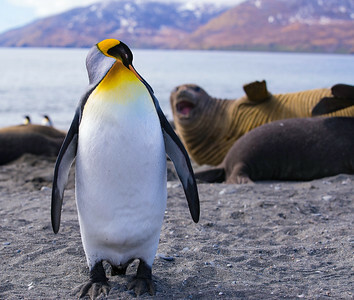 St. Andrew’s Bay, South Georgia and the South Sandwich Islands Google Maps Location photo was taken from: https://goo.gl/MvFWKT What is amazing, besides the King Penguins themselves, is the eye-popping scenery all around you juxtaposed against these stunningly beautiful, but funny goofballs. 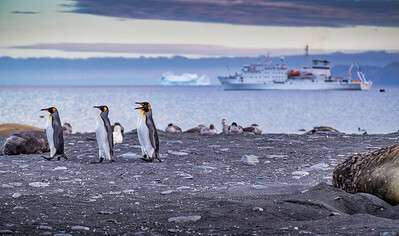 The scenery is almost not what you’d picture to be paired with a penguin, like a 10,000 foot mountain range as a backdrop, which is why St. Andrew’s Bay was one of my favorite landings of the expedition. The feeling I get from these cuties here is one of “Alright, we made it to the top, where do we go now?” One is taking a break on its belly, others are taking in the view, some are preening. Such fascinating creatures. 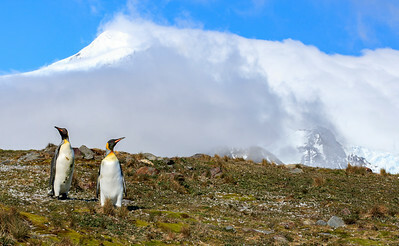 Gold Harbour, South Georgia and the South Sandwich Islands Google Maps Location photo was taken from: http://goo.gl/Z82Bcb After you get over the initial holy crap, I’m standing a foot away from a king penguin, you come down to earth and start taking in the subtleties of each of these wondrous creatures. Each with its own personality, its own bravery in how close to approach us humans, its own watchful curious eyes, the windows to the soul. While it is an innate tendency of human psychology to anthropomorphize non-human subjects, I like to think that at least somewhat, these beautiful creatures were just as curious about us as we were of them. 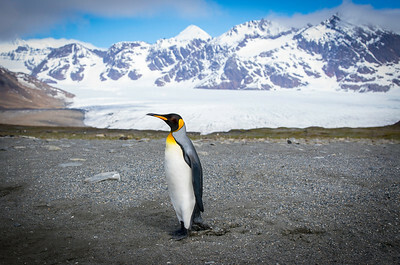 Salisbury Plain, South Georgia and the South Sandwich Islands Google Maps Location photo was taken from: https://goo.gl/PJfNdM This adorable penguin chick was mesmerized by my camera and I for some reason, even though there were so many others who had the same, taking photo after photo like I. Who knows, maybe we were just meant for each other. While other penguin chicks were waddling and running around like 2 year old kids in a candy store, this one sat still and posed for me not more than a few feet away, for probably a good few minutes. When you get to see these beautiful creatures in the wild and observe them naturally, everything just fades away, your mind goes quiet and you become one with nature. How I wish I could be back there at this very moment. Do You See the Light?!?!?!? Fortuna Bay, South Georgia and the South Sandwich Islands Google Maps Location photo was taken from: https://goo.gl/inm777 The moment we laid anchor in the bay, clouds had socked in all of the mountains. It was doubtful that after lunch, we would be able to hike the famous last leg of Shackleton’s hike to Stromness. So there we were onshore, milling around, trying to work with the flat, gray overcast skies. And then, like that moment in Blues Brothers (“Do you see the light?!?!? !”), where the sun shines down on Jake Elwood, the same happened here. Clouds parted, the sun came out in a rage of glory and the stunning kings lined up for this shot. In a flash I lowered my tripod as far as it could go, less than a foot off the ground, me kneeling in the icy cold water to frame the shot and not startle them off, as the water immediately ran down inside my boots. But I could have cared less that my feet were soaked, for I came away with this. The things us photogs do for a shot. Bleaker Island, FIQQ 1ZZ, Falkland Islands/Isla Malvinas Google Maps Location photo was taken from: http://goo.gl/cSLq6i Besides these King Cormorants hilarious behavior and funny honking sound, their hairdos were straight out of a movie. It's as if this one stuck its wing in a light socket. I had to capture that and the expression I got along with it was priceless. You lookin' at me?!?! Punk! Bleaker Island, FIQQ 1ZZ, Falkland Islands/Isla Malvinas Google Maps Location photo was taken from: http://goo.gl/cSLq6i These King Cormorants were absolutely hilarious! Just like the penguins who steal rocks from each other, these guys steal each others twigs and brush from nests. Some even got in tug of war fights with each other. I wanted to grab a head on shot of one, with their unique and colorful color. And add in that it was sprinkling a touch, so I wanted to also capture the rain in the shot. Not wanting to lower my shutter speed too much to keep the cormorant in focus, I lowered it just enough to capture the rain and achieve perfect focus. 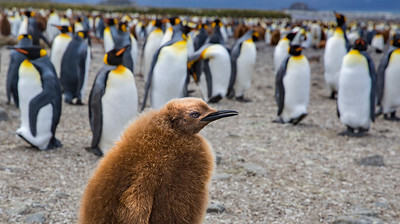 Salisbury Plain, South Georgia and the Sandwich Islands Google Maps Location photo was taken from: https://goo.gl/mzwM67 I just love these little king penguin chicks. They are so the polar opposite in behavior compared to most of the adult kings, for it is just like what you would expect from a 2 year old human kid. Not only are they the loudest ones on this plain, squawking left and right as if “Look at me mom and dad!! Look what I can do!! I can flap my wings! !” to running around like crazed lunatics, amped up on sugar, again, like a 2 year old kid. Most of the adults, when a chick was doing something annoying or running into them, had this exasperated look on their faces like “Hey George, is this your kid? Can you tell him to knock it off?" Holy Moley!! that's a lot of Penguins!! Salisbury Plain, South Georgia and the Sandwich Islands This is but a small slice of what we saw that day on Salisbury Plain, the largest King Penguin colony, with around 500,000. And add in the baby chicks who hatched a month ago, those little brown furballs also known as oakum boys. Take this picture and multiply it by about 20 wide and 4 high and that's how large this massive field of penguins was. Let alone the sheer stunning beauty and size of this, add in the adorable sounds of them cawing and them bumbling around 2 feet from you, some of them nipping at your pant leg or tripod leg, and you were left in awe. Just stunning sights to see here. Gold Harbour, South Georgia and the South Sandwich Islands Google Maps Location photo was taken from: http://goo.gl/Z82Bcb These baby elephant seal pups, barely a few weeks old, crawled into our basecamp at Golden Harbour the moment we stepped ashore from our Zodiacs. 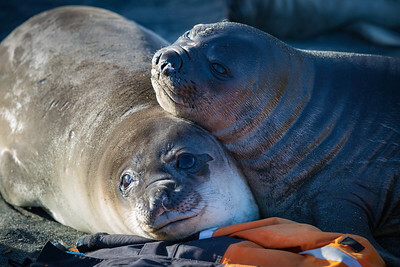 These adorable blubber balls with their fat folds and doughy eyed cuteness, raised for only 2-3 weeks before their moms left for sea, are now faced with a sink or swim future, having to fend and provide for themselves. Not fearing us, they slow crawled their way into camp, barking and belching along the way, looking at us as if “Are you my mom? Do you have milk for me? Feed me please?” You could sit in the sand and they would literally come right up, some even resting their head a bit on your leg, before depositing or sneezing some boogers on you. Things like this, even with a pic, can’t even be put into words how magical it was to experience a moment like this. Where the hell are we Bob? St. Andrew’s Bay, South Georgia and the South Sandwich Islands Google Maps Location photo was taken from: 54°26'22.908" S 36°11'24.989" W Most of the time, the King Penguins are usually in groups of ten to twenty or a colony of 150,000 to 500,000, waddling around like adorable little black and white tuxedos, with a colorful bouquet of flowers on top. So you get a lot of shots with loads and loads of them, all huddled together. Finding solo or one pair of the Kings like this was the challenge. Besides just these two, I love the setting of green, rugged hillside; rocks that could impede their journey, strewn here and there; the angle of the shot looking up at clouds with a barely perceptible mountain peaking through. It’s as if these two have been forging trails in the mountain wilderness, reached the top and now have a look of “Where in the hell are we George?” And look at poor Bob. Got the front of his suit all dirty. St. Andrews Bay, South Georgia and the South Sandwich Islands Google Maps Location photo was taken from: 54°26'10.481" S 36°11'17.178" W A traffic jam of female elephant seals like these at St. Andrew’s Bay, along with some king penguins scattered in, was a common occurrence at some of the larger beachheads like this. This harem of females, numbering 40 or so, were all hitched to one male seal named the beach master, who was a good 15 feet long at 3 or so tons. 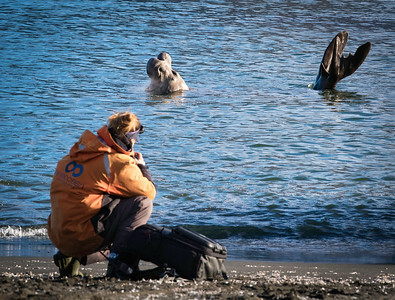 Any time another solo male elephant seal encroached on this harem, you would be shocked at how quick his 3 ton pile of blubber could move at the impending intruder. Most of the time the fast charge would scare them off, but sometimes they would rise up on their haunches and slam their massive bodies together, while gnashing at each others neck with their sharp teeth. The beach master always won. Gold Harbour, South Georgia and the South Sandwich Islands Google Maps Location photo was taken from: 54°37'3.365" S 35°56'31.739" W Sun was just setting at Gold Harbour. 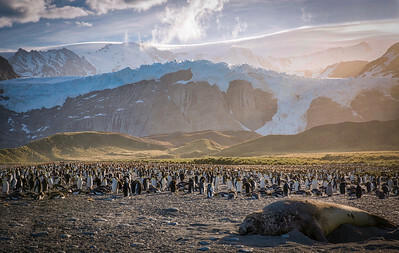 The sun was slowly fading behind the mountains, casting a beautiful golden glow over Bertrab Glacier and the colony of King Penguins, which numbers about 50,000. This was on the small side, compared to other beaches like St. Andrews Bay and Salisbury plain, with 300,000 and 250,000 respectively. And while looking back at a 1.5 hour time lapse I also shot from this position, that giant male elephant seal barely moved from his position the whole time. 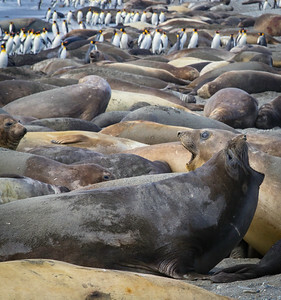 The chaos and noise of the colony behind him and he never waked. While the other locations have more numbers of Kings, with Gold Harbour’s cliff faces and glaciers so close to us on the beach, it made for an intimate setting like no other. St. Andrews Bay, South Georgia and the South Sandwich Islands Google Maps Location photo was taken from: 54°26'8.681" S 36°11'16.631" W When you could find open space on the beachhead at St. Andrews Bay, not clogged up with elephant seals, you were greeted by gaggles of King Penguins like these, waddling along. 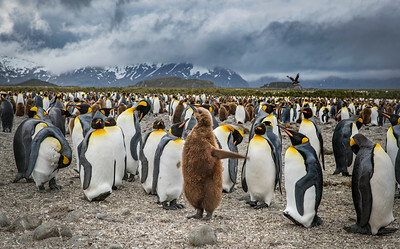 Groups of ten to twenty would walk right up to you, look at you and then move on after realizing you aren’t a penguin. The largest colony of Kings in all of South Georgia at 300,000, for this 2 mile stretch of beach, they dotted the whole shoreline and then some. Go further inland and you are greeted by the bulk of the colony. Luckily we were there in November when it wasn’t the “hot” summer months. 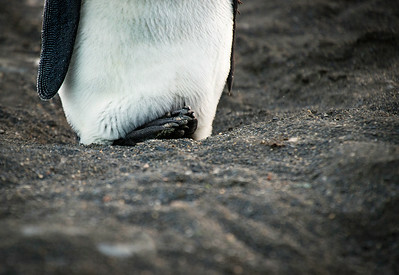 According to our expedition leaders, the smell of the penguin guano can get quite rank. Gold Harbour, South Georgia and the South Sandwich Islands Google Maps Location photo was taken from: 54°37'3.432" S 35°56'31.799" W After the sun set at Golden Harbour, the clouds were a beautiful purple and red, in the soft afterglow of twilight. While the majority of the Kings were huddled further up the beach at their colony, packs of a few like this were scattered and waddling amongst the shoreline. Add in some elephant seals, southern giant petrels and skuas, and you have your evening ocean view. Our trusty seafaring ship, the Vavilov, lay offshore, sending Zodiacs over to pick everyone up. You can barely make it out, but the small black dot behind it is one of the Zodiacs coming to shore, And while it looks closer that it is, an iceberg off in the distance, was one of the first we saw while in South Georgia. 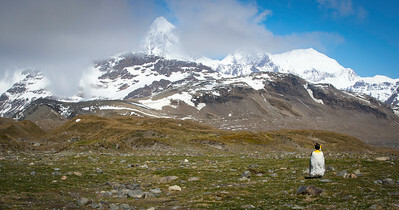 St. Andrew’s Bay, South Georgia and the South Sandwich Islands Google Maps Location photo was taken from: Click Here For the longest time, I tried to get a shot of a single, lone King, in front of this gorgeous mountain range and glacier. 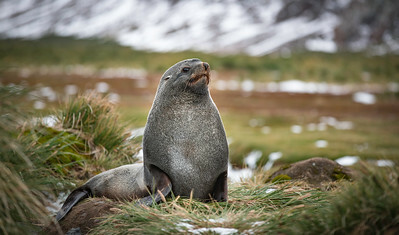 When you come onto the beachhead at St. Andrew’s Bay, there are penguins, seals and whole host of other marine and bird life scattered in the thousands across a densely packed landscape. 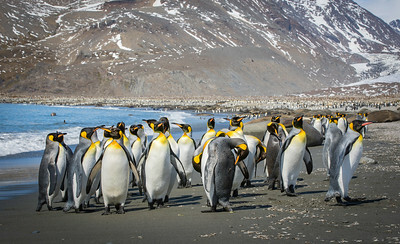 The King Penguin colony alone was close to 300,000. Down near the beachhead, it is especially crowded, with most of the Kings in groups of ten to twenty or more. So when this adorable King waddled ahead of his group by about ten feet or so, I scrambled into place. And being that I had to scramble quickly, had my exposure setting way too hot, but luckily was able to recover all the details. What was a mistake on my part, turned into one of my favorite photos from the whole trip. Drygalski Fjord & Larsen Harbour, South Georgia and the South Sandwich Islands GPS Coordinates: 54°50'10.032" S 36°2'35.892" W This was a rare sighting down in South Georgia, for Weddell Seals live in a circumpolar distribution around Antarctica. 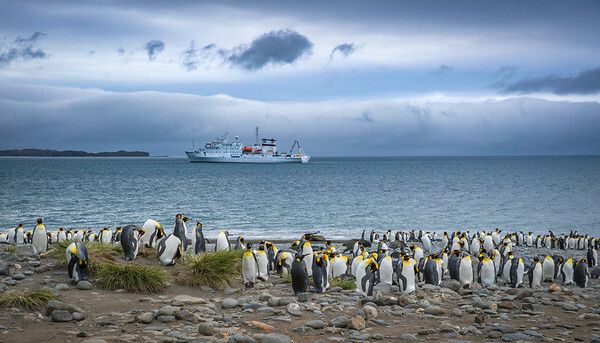 Our One Ocean expedition guides told us there has been a small population of Weddells observed year-round here in Larsen Harbor, along with some others who have been seen in South America, New Zealand and south of Australia. There was only this one lying on the small spit of flat land, in what is mostly sheer cliffs of the fjord and no flat shoreline. Our expedition guide got our Zodiac to about 20 or so feet and turned off the motor, as to not disturb it. As we clicked away grabbing shots like this, it just sat there on its side looking at us, never moving, with not a care in the world. Gold Harbour, South Georgia and the South Sandwich Islands GPS Coordinates: 54°37'2.615" S 35°56'21.594" W These adorable elephant seal pups were everywhere at Gold Harbour, from the moment the first group unloaded off the zodiac, to when the last departed. It was a literal swarm of a these cuties, coming up to the home base on the beach, which is where everyone could leave their belongings, along with an expedition guide always present to assist with anything. My friend I probably spent a good half hour or more, sitting in the sand, while these pups came right up to us within inches, soaking it all in. I mean honestly, how could you not love them, with their puppy like faces, and big round, inquisitive, curious eyes, looking right at you. These few week old pups were looking at us for food, more specifically, milk. Their moms trained them for 2-3 weeks and then took off to sea, gone for at least a few years before seeing them again. While it might seem harsh, in nature, it is sink or swim. For these pups, instincts will kick in and most will survive to grow into adulthood. I'm the Beachmaster, Hear Me Roar!! Gold Harbour, South Georgia and the South Sandwich Islands GPS Coordinates: 54°37'2.597" S 35°56'21.348" W Behold the Beachmaster!! This guy was huge! 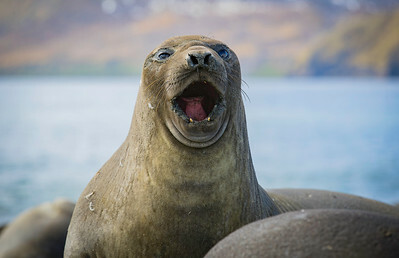 And he just won a fight in the water, dueling with another smaller male elephant seal. His post-victory end-zone dance/celebration/chest pounding/I-am-seal-hear-me-roar, was close to a minute long. It was a deep, gut-punching, machine gun like belch, over and over, until he made sure no other male would mess with him. It is said this roar can be heard from over mile away and I strongly concur, sitting no more than maybe 100ft away. With a slight chill in the air, he was expending so much effort doing this, that you can even see steam protruding from its open mouth. The rawness of nature is so amazing. Hmmm, Where'd My Crew Go? St. Andrews Bay, South Georgia and the South Sandwich Islands GPS Coordinates: 54°26'16.601" S 36°11'22.205" W The thing I loved about St. Andrews Bay, was the variety of terrain we got to walk around on, that covered a wide expanse of the bay. 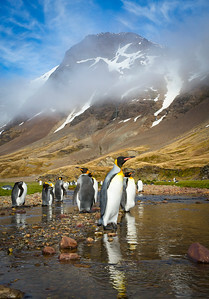 You could either stay down near the shoreline, wandering the almost 3 mile long stretch of the beach, or head up into the hilly terrain, where a lot of the King Penguins reside. Their massive colony, the largest on the island at nearly 500,000, was further up from the beach, and to get there, you had to hike up these hills for a good twenty minutes. All along the way, you would find these solo Kings, just chilling, standing all by their lonesome, as if they were lost or just needed some alone me-time, away from the colony. If I were a penguin here, I would probably do the same, for when you were standing on the hill overlooking the colony, the noise was almost deafening. Gold Harbour, South Georgia and the South Sandwich Islands GPS Coordinates: 54°37'3.479" S 35°56'31.313" W Just like I have mentioned before, Gold Harbour was one of my favorite landings in South Georgia. The Kings here were especially curious and bold and would waddle not more than a few feet or less to you, inspecting you like some detective on a murder case, moving its head from one side to the other. And their eyes were so expressive and emotive. They would sit for many minutes at a time, staring at you all beady eyed. I so wish I knew penguin talk, like the Dog Whisperer but for penguins. “Hey buddy, what’s up? How’s it going? Catch any good fish today? Water chilly?" At that moment, I came to the realization that if I could redo my career path from experiencing and knowing what I know now then, I would in a heartbeat have taken a path that involves something with these magnificent mammals. I am just lucky enough to have experienced this firsthand, all thanks to my passion for photography. Gold Harbour, South Georgia and the South Sandwich Islands GPS Coordinates: 54°37'3.437" S 35°56'31.692" W King Penguins breed under some of the harshest conditions and due to their unusually long breeding cycle of 14-16 months in this part of the world, really only get to reproduce twice every 2-3 years. Mating usually starts so chicks are born during the harshest months. 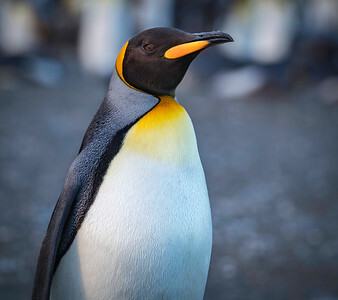 This allows mature penguins who leave their parents, to do so in the summer when food is plentiful, allowing for their best chance at survival alone. Visiting in November, we were hitting the tail end of the breeding cycle, that spans from September, with couples who were unsuccessful last cycle starting even earlier. When the egg is laid, both couples take turns incubating it, balancing it on their feet and covering it with a warm layer of feathered skin called a brood pouch, while the other goes out to sea to hunt for fish. About two months later, the chick will hatch and spend another 30-40 days under this pouch for protection. After that period, the chicks are large enough to protect themselves and start curiously exploring their world. Then in light of all that, factor in their baby might not even survive and make it into childhood during that time. Life in South Georgia is so very fragile and so very precious. Open Up & Say "AHHHHHH!!!" St. Andrews Bay, South Georgia and the South Sandwich Islands GPS Coordinates: 54°26'10.979" S 36°11'17.441" W This adorable female elephant seal was bobbing her head up and down the whole time I was near her. I think she may have been trying to toss sand on her back, which could be to keep her body temperature comfortable while on land. Each time she kept getting higher and higher, her mouth crept open further. I just waited and timed this shot, at the highest point of her motion, mouth and eyes fully open with wonder, and a pink tongue in all its glory. It was almost like she knew I was wanting to photograph her, so she put on her best show. Salisbury Plain, South Georgia and the South Sandwich Islands GPS Coordinates: 54°3'39.137" S 37°19'31.361" W This adorable puffball wandered right up to me, not more than a 2-3 feet from where I was standing. It just sat there, all still, looking up at me inquisitively, its tiny eyes revealing so much of its character and how interested it was in figuring me out. I had my camera on my tripod, complete with the usual setup and big lens, so maybe it thought it was another penguin like itself, only larger? But with some odd creature behind in dressed in a bright red coat? A few of the others on this expedition to South Georgia were fortunate enough to have these cuties peck and nibble at their water/wind proof winter pants. While all his/her buddies were running around all crazily, like kids on a playground, it did not move an inch from where I was. I’d like to think we were both fascinated with each other. St. Andrews Bay, South Georgia and the South Sandwich Islands GPS Coordinates: 54°26'9.96" S 36°11'16.817" W Only a face a mother could love. 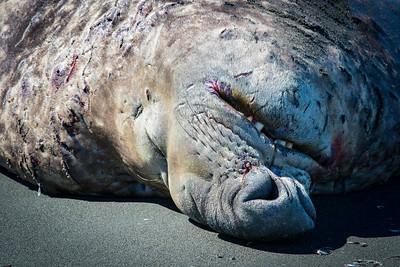 This “adorable” full grown male elephant seal, was basking in the sun, laying on its back, fast asleep, snoring deep zzzzzzzzz. These suckers can grow up to 20 ft and come in close to 9,000 pounds. 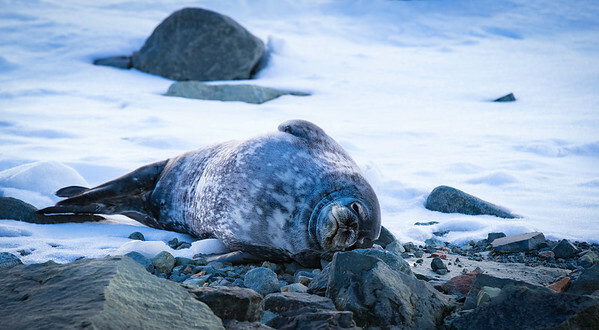 You can see the bloodied gnash marks all along the side of its head, which are from the fights with other males, fighting over territory and female seals. Every time it let out air, its proboscis, the bulbous nose with a sack-like appendage, would flutter back and forth. It was like one of those Disney or Warner Bros. cartoons from back in the day, when the cartoon character would be sleeping on their backs and their lips or nose would flutter and expand in an overly exaggerated way. Only on males, this proboscis and the more folds it has, allows for it to amplify snorts, grunts and loud, drum-like bellows that can be heard miles away. When you are standing 15-20 feet away and a male starts grunting, you feel it rattling your soul. Salisbury Plain, South Georgia and the South Sandwich Islands GPS Coordinates: 54°3'37.331" S 37°19'25.98" W After we landed on the beachhead at Salisbury Plain, we were immediately engulfed by swarms of King Penguins like this. There were so many right near the water’s edge, that the zodiac drivers had to be careful not to hit them, as they tried to come ashore and land. While smaller in the numbers compared to St. Andrews Bay, with about 50,000 more, I liked Salisbury just a tad bit more, due to how accessible and close you could get to the main colony. 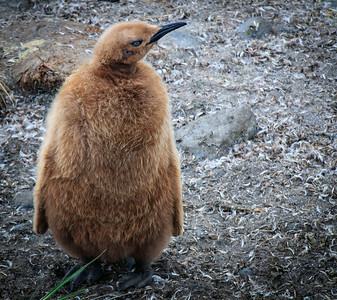 You walked probably an eighth of a mile and there you were, standing in front of a 250,000 King Penguin colony, complete with the full grown adults and their puffy brown kids. South Atlantic, South Georgia and the South Sandwich Islands GPS Coordinates: 53°15'7.506" S 45°45'47.028" W Imagine trying to photograph a fast moving bird in the sky about a hundred feet or more from you. Now imagine doing that, but while on a boat, in the middle of the South Atlantic, in choppy waves, trying to balance yourself so you not only don’t fall overboard, but also steady yourself and hands enough, while fully zoomed in about 400mm, to get a tack sharp, in-focus shot. Not to mention all that, add in cold blowing wind and spray of the ocean, freezing your fingertips, face and body. 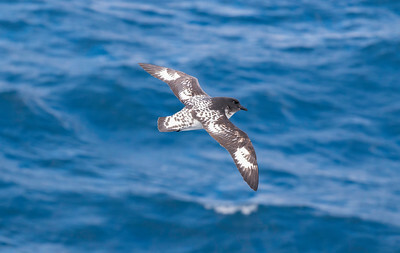 This absolutely beautiful Cape Petrel lined up just perfectly. I couldn’t believe it when I got back and looked through the loads and loads of photo bursts and found this gem. Just stunning! After the sun set at Golden Harbour, the clouds were a beautiful purple and red, in the soft afterglow of twilight. While the majority of the Kings were huddled further up the beach at their colony, packs of a few like this were scattered and waddling amongst the shoreline. Add in some elephant seals, southern giant petrels and skuas, and you have your evening ocean view. Our trusty seafaring ship, the Vavilov, lay offshore, sending Zodiacs over to pick everyone up. You can barely make it out, but the small black dot behind it is one of the Zodiacs coming to shore, And while it looks closer that it is, an iceberg off in the distance, was one of the first we saw while in South Georgia.